Can I Take a Hot Shower While My Dishwasher is Running? This entry was posted in Water Heaters on February 26, 2017 by . Are you having issues with maintaining enough hot water for all of your daily activities? Your hot water works hard 24/7 to make sure you have enough hot water for your showers, laundry, dishes, and hand washing. But can it give you all of those things at once? One common question we get is whether or not it’s ok to take a hot shower while running the dishwasher or washing machine. Our answer: it depends on your water heater, the size of your home, and many other factors. One way to find out for sure? Try it. One thing that you might notice if you take a shower while your dishwasher is going is that your shower head will have less water pressure. This might result in a less than optimum shower experience, although you should still have enough water pressure to get adequately clean (both your body and your dishes). Of course, you also have to consider the water temperature. If you’re running hot water for your dishes and hot water for your shower, you might deplete your water heater’s ready hot water supply. If you try it and your shower turns lukewarm or cold at the end, you know you’ve gone through all the available hot water. How big is your hot water heater tank? If you recently did the laundry and then ran the dishwasher and you have multiple showers going on at once… you’re probably going to go through your hot water supply before it has time to build back up. If you are frequently running out of hot water and aren’t able to adjust your schedule, consider installing a tankless hot water heater for your bathroom. If you are prone to taking 20+ minute showers, consider cutting back. Or, if your shower time is set in stone, forgo running the dishwasher at the same time and opt for running it before or after your shower. You also need to think about the volume of hot water your dishwasher is using each cycle. 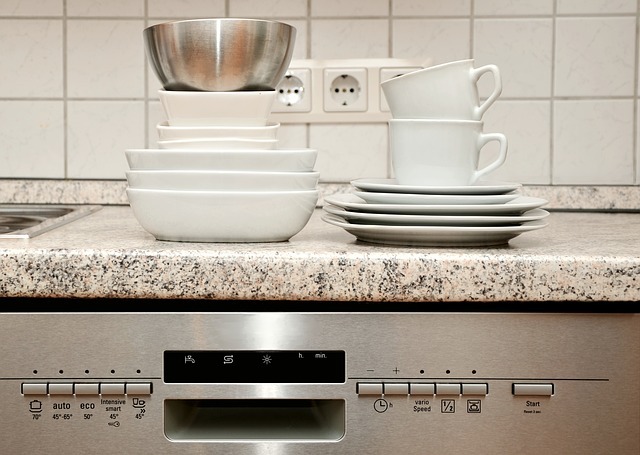 Try upgrading to a high efficiency dishwasher to cut down on water use. This will also allow you to run multiple fixtures at once without running out of hot water.